In Bali, the practice of Subak refers to the cultural, religious, and practical tradition of irrigation which primarily revolves around rice farming. Additionally, this term describes a democratic association of farmers practicing the cultural traditions of Subak. There are approximately 1,200 of these associations across Bali, each made up of 50 to 400 farmers who collectively manage irrigation from a single source of water that they share. Subak is first referenced in writing more than 1,000 years ago, in 1072 CE to be exact. In the 11th-century individual Subak systems became so massive that they became man made watersheds, and began to change the geography of Bali making it into the landscape we know and love today. Stop and think about that for a moment. Humans were significantly reshaping their environments a thousand years ago. Thankfully, due to the Balinese philosophy of Tri Hita Karan, these ancient people understood the importance of harmony and balance, such that their reshaping the environment contributed to the ecosystem, rather than ruining it. Tri Hita Karan translates to “Three things that create happiness, and well-being.” This is accomplished in Subak’s three guiding principles: Parahyangan, which is to creating a harmonious relationship between humanity and God; Pawongan, creating harmonious relationships between a person and his neighbor (much like the western concept of the golden rule); and Palemahan, which is to maintain harmony between humanity and the natural environment. Spirituality (Parahyangan) is arguably the most important aspect of Subak, as it acts as the cultural glue that holds it all together. Rice is considered a gift from god. The appreciation for rice plays an important role in the water temples, called Pura Bedugul, where religious ceremonies are conducted. These ceremonies pay tribute to Dewi Sri—the goddess of fertility and prosperity who also venerated by the Javanese, and Sundanese—giving thanks for bestowing the gift of rice, and offering pleas for blessings of a future bountiful harvest. Additionally, these ceremonies promote the other two aspects of the Tri Hita Karan. By drawing the farmers together to practice in harmony, Pawongan is achieved. Additionally, Palemahan is seen in the observance of ceremonies that remind farmers that they are dependent on the life-sustaining forces of the natural world, and that a mutually beneficial balance between humanity and the natural world must be maintained. The concept of harmony between people—Parahyangan—is further exemplified is the democratic structure of a Subak. The function of the entire system is reliant on each member being of equal status, and having equal voice as any other member. A single greedy individual could throw an entire association out of balance. Thankfully, because these are firmly held, ancient cultural traditions passed from generation to generation, it is unheard of for anyone to try to manipulate the system for personal gain. If this does happen, the offending member may be sanctioned. The rules, and enforcement of rules is also made by collective decision. In fact all functions of a Subak, all the planning, decisions, distribution, problem-solving, deciding what kind of rice to plant, when to plant, when to harvest, the development of fish ponds to maintain proper ecological balance, and more, is discussed and decided as a group. The practice of Subak is essentially the practice of equality and fairness. The third principle of Palemahan is accomplished by the focus on environmental balance, and sustainability. During planning, a Subak will set up and maintain their systems to be in harmony, rather than in opposition with the natural world. The key is thinking of nature as an equitable partner, rather than a resource to be exploited. Water need, availability, and ways to optimize consumption are prioritized in planning. Next, work is done to prevent unwanted drainage of water away from the rice patties, and to capture and reuse as much water as possible; people are assigned to monitor for waste issues that need to be addressed, ensure water remains clean, and that crop-killing pests are driven away from the farmland, to prevent waste of crops that have already used water. While certain pests are driven out, sometimes other wildlife—such as fish—are introduced to help maintain a vibrant ecosystem. Members within a Subak are called Krama Subak (which simply means member of the Subak). This membership is divided into three subcategories. There are the Krama Aktif who are actively participating members of the Subak. Those who provide financial support the function of the Subak in lieu of active membership are called Krama Pasif. Finally, members who are not active because they have other important duties that take up too much time (such as being a village chief) are called Krama Luput. All of these members are given water irrigation rights and are able to give equal voice their opinions during meetings. Members with higher financial or social status have the same amount of power within a Subak as any other member. All members of a Subak are made up of farmers from the region a Subak serves. These are social positions, divorced of any kind of compensation or bribery, and so not even the leadership of a Subak draws any kind of income from their position within the Subak (they of course all receive income from the sale of their own crops, which are successful due to the efforts of the Subak they are a member of). Each member within a Subak plays an important role. They will either hold a specific office, or be part of a group that is responsible for specialized tasks. The Sekaa (loosely translated to group) are comprised of the bulk of the individual farmers within a Subak. The Sekaa Numbeg is the group in charge of cultivating land to prepare for planting. The Sekaa Jelinjingan are responsible for the maintenance of irrigation tunnels. The group responsible for preventing theft, and keeping out animals who will either destroy crops or corrupt the water supply are called the Sekaa Sambang. During rice season the Sekaa Memulih plant the rice, the Sekaa Mejukut pull weeds, the Sekaa Manyi harvest it, and the Sekaa Bleseng carry the harvested rice into the barn. Sharing the labor in this way ensures that every farmer has a bountiful crop, as everyone has equal stake in all the work they do. Having more crops that are successful provides more food, prevents starvation, and promotes regional happiness. Because each Subak governs itself, and the members have a wide angle view of all the farms within a Subak, farmland can be treated as a regional resource, making its overall management easily optimized, fluid, and synergistic. Subak leadership is similar to any other democratic organization being made up of a head (Kelian), a deputy head (Petajuh), secretary (Juru tulis), treasurer (Juru raksa), a person in charge of sending out notices and making announcements (Kasinoman), and a person in charge of the spiritual duties during rituals or other religious events (Pemangku). All of those in leadership are democratically elected, and are charged with serving the members of the Subak equitably. Because Subak is such a closely held, long standing tradition, abuse of power by leadership is virtually unheard of. No examples could be found in research for this article. Finding a good source of water is understandably important. A good source will be elevated, to allow for easy transport through canal and tunnel systems. It should also be protected in some way, by forest, or land topography or something similar. It should be protected, from erosion, contamination, and theft. From there, water is moved to terraced rice patties through canals, underground tunnels, systems of small dams, and temples. The temples act as hubs, and are placed at intersections and dams. Water can be redirected as needed from these locations. Final distribution to rice patties is based on the needs that were established during planning. The efficiency of this system has kept it alive for more than a thousand years. Too often we dismiss ancient man as being primitive. Well, don't sell ancient man short! You would be hard pressed to find a more efficient, fair, and environmentally sound modern irrigation system than the ancient system of Subak. Selfishness and greed are left at the door, which is why the spiritual, and cultural aspects of this system are so important to its continued success. Ulun Danu Batur Temple - located at the end of lake Batur, thought to be the primary water source for all the water used in Balinese Subak. Subak Landscape of Watersheds Pakersian - the oldest known irrigation system still in use. Subak Landscape of Catur Angga Batukaru - which contains the Jatiluwih rice terraces, the world’s most famous rice patty tourist attraction. Taman Ayun Temple - famous for it’s beautiful architecture, built in the 19th-century during the royal government’s expansion of Subak during this time. It is said to have been the centerpiece of this expansion. There is a Subak preservation museum located in the Tabanan regency that is aimed toward locals and tourists alike. The Tabanan regency was selected as the location because this region has far more Subak systems than anywhere else in Bali. So much so that it has been nicknamed the granary of Bali. Founded as “Subak Museum: Bali Agriculture Collection & Traditional Irrigation” on August 17th 1975, its intended purpose was to help young Balinese become engrained into Subak culture. It was later renamed to “Subak Museum” on October 13th 1981 by the current governor of Bali, Prof. Dr. Ida Bagus Mantra. What makes Subak work is balance. There is balance between people, nature, and spirit. The spiritual aspect of the culture keep the people in balance with each other and the natural world. Even though the western world doesn’t have the rich tradition exemplified in the philosophy of Tri Hita Karan, we could still incorporate some aspects the of Subak within our own irrigation systems. Creating collectives of farmers who can plan and discuss water use and distribution, for instance, would in of itself cut back drastically on water waste. No matter how the world chooses to address the issue of water shortage, a paradigm shift in the way we approach water distribution and use will be necessary. Why not use a system that has been successfully fighting water waste for over a millennium as a template? 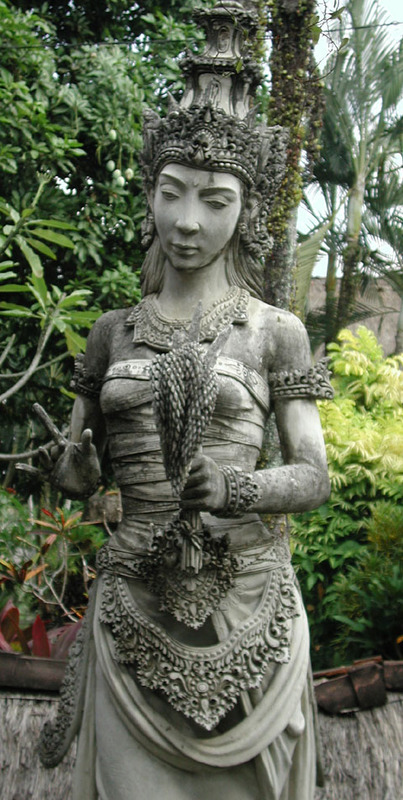 We just need to do as the Balinese do, and work together.